As president of a major pharmaceutical empire, Peter Haskell has everything. Power, position, a career and a family, which mean everything to him, and for which he has sacrificed a great deal. Compromise has been key in Peter Haskell’s life, and integrity is the base on which he lives. Olivia Thatcher is the wife of a famous senator. She has given to her husband’s ambitions and career until her soul is bone dry. She is trapped in a web of duty and obligation, married to a man she once loved and no longer even knows. When her son died, a piece of Olivia died too. Accidentally, on the night of a bomb threat, they meet in Paris, at the Ritz. Their totally different lives converge for one magical moment in the Place Vendôme, as Olivia carefully, silently, steps out of her life and walks away. As the two strangers meet, their lives become briefly enmeshed. In a café in Montmartre, their hearts are laid bare. Peter, once so sure of his path, so certain of his marriage and success, but suddenly faced with his professional future in jeopardy. Olivia, no longer sure of anything except that she can’t go on anymore. When Olivia disappears, only Peter suspects that it may not be foul play. And if he finds her again, where will they go from there? 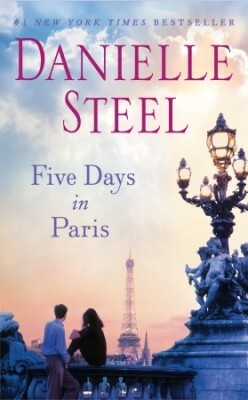 Five days in Paris is all they have. They go back to their separate lives, but nothing is the same. At home again, they both must pursue their lives, despite challenges, compromise, and betrayal. Everything they believe is put on the line, until they each realize they must stand fast against compromise and face life’s challenges head-on.